EUREKA! I've struck gold! Or maybe Platinum. 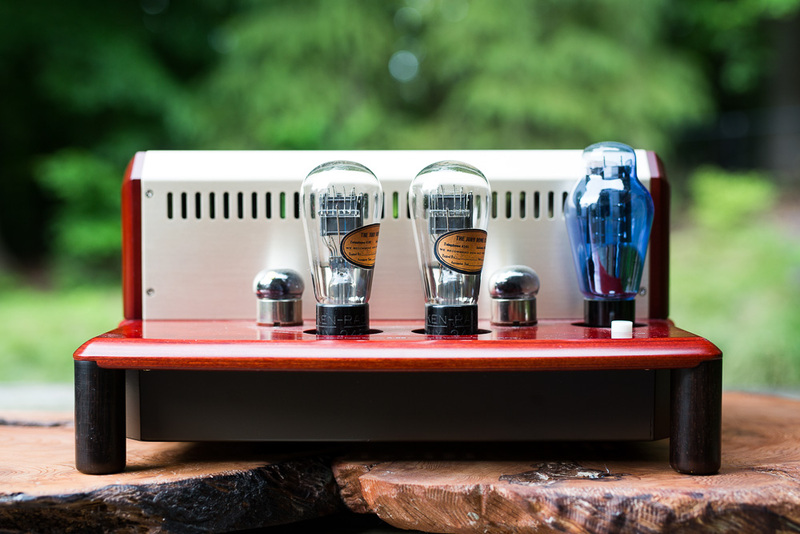 Here it is folks, my favorite amplifier so far. If this is not a work of audio art, I have no idea what might be one. 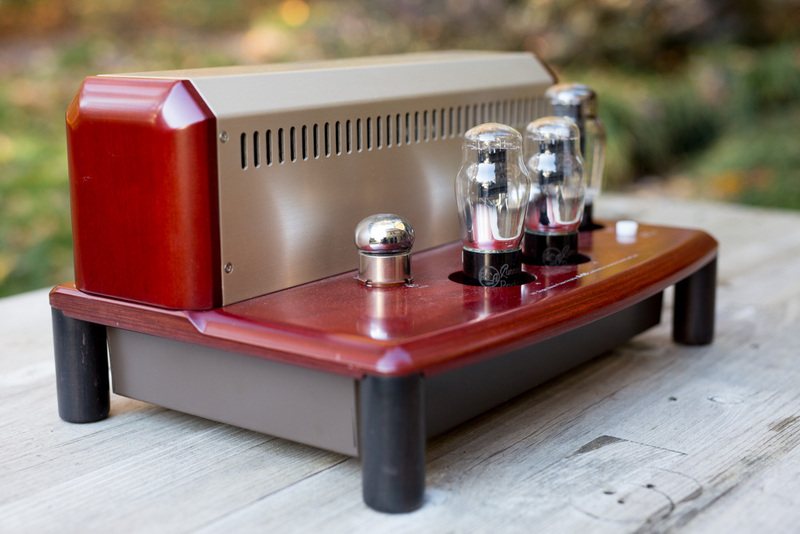 This is a ten year old Yamamoto A-08 “45” Single Ended Stereo Power Amplifier, and it is truly stunning. How to describe this one? Its so different in its way from anything I've had so far, it really just doesn't have a precedent for me. Although made in some numbers, its probably the most custom amp available anywhere; basically everything here is made in house at Yamamoto Sound Craft Corp and is unique. 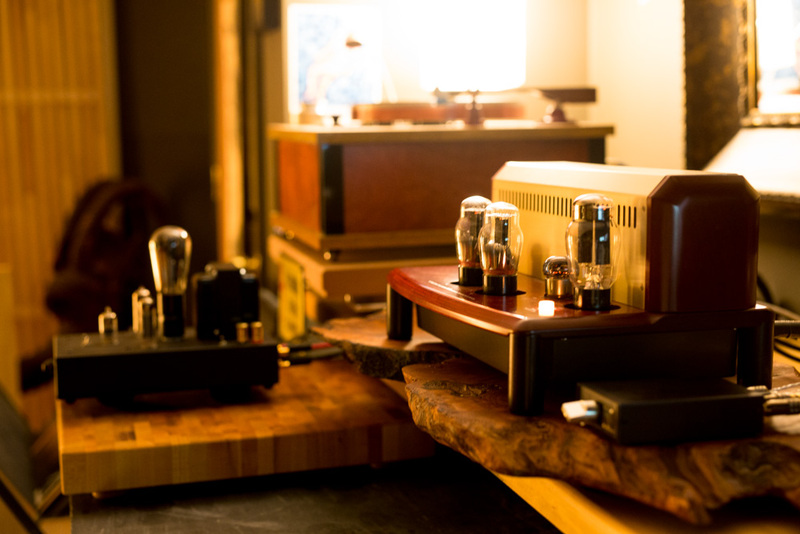 Instead of gathering parts and then making an amplifier, Yamamoto makes his own everything: speaker connectors, rca plugs, transformers and chokes, tube sockets, even capacitors. The chassis is cherry wood made into a hardened form and then precision CNC’d. 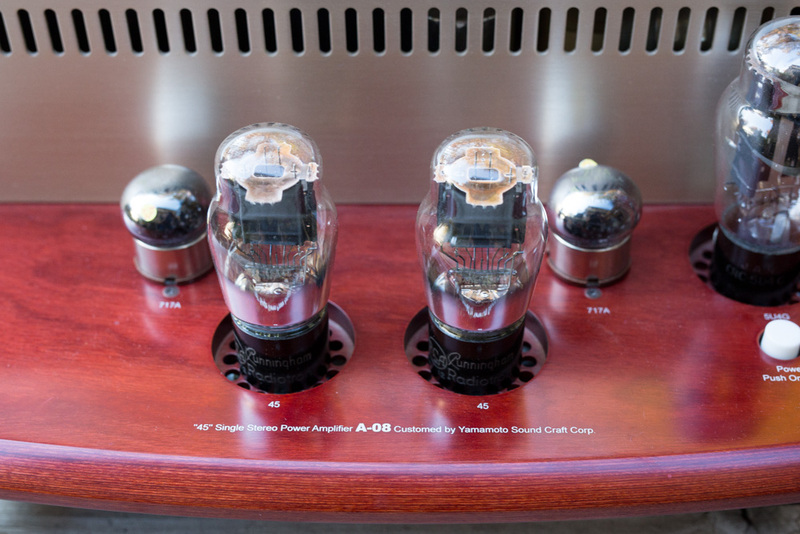 The amps were even supplied with NOS Cunningham 45, Western Electric/Raytheon 717a and JAN 5U4G tubes, individually chosen for the specific amplifier. I wont go much further, there is plenty of documentation online about the how/what/wheres and its a great story. 6Moons really does this justice and is right on! Suffice to say that in person this stuff is even better than imagined. 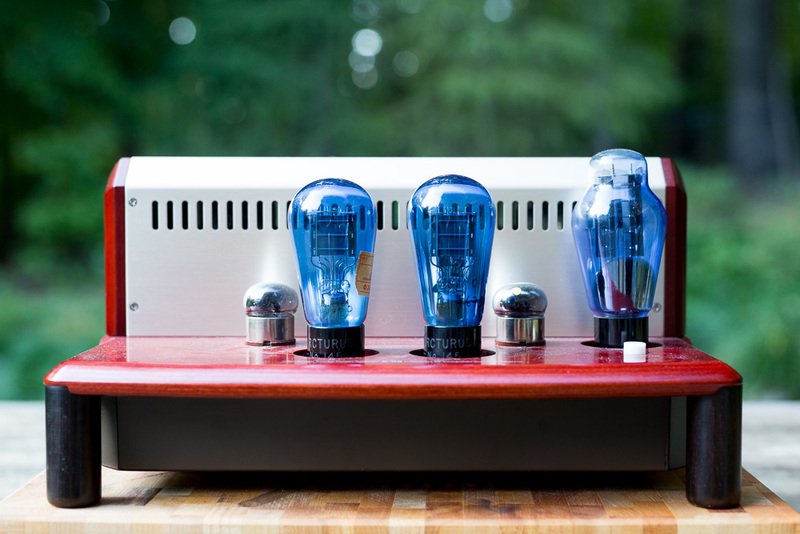 This is a single ended amp at its finest and purist. And its impressive. So, how does it sound? Very, very good. 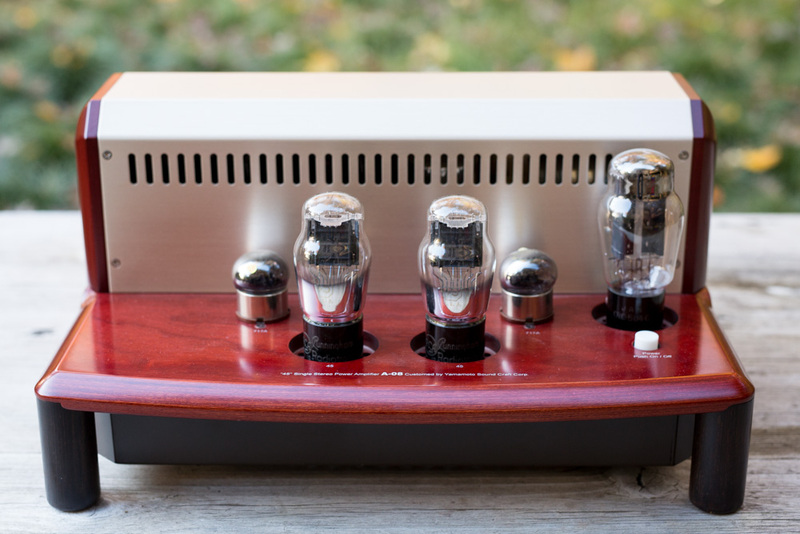 In the past year or two I’ve narrowed things down to what I like best (and could afford to keep), and that’s been Oliver Sayes’s SE46 and Steve Deckert’s entry amp, the SE84UFO. In direct comparsion, using the Luminous Audio passive for volume control on the Yamamoto, the Yamamoto brings more clarity than either the Sayes or the Decware, and sounds more "natural" as well. Of course its slight at this level, but things seem to jump out of real space from this amp. One example; a track I know well starts with an African drum in a big sounding recording space. Its mic'ed close, and this amp seems to bring the texture and the resonance of that drum (even what seems like the inside resonaces) right out into the open in a way nothing else has before. There are numerous similar examples and I keep finding new ones. Its a detail FREAK. But it still sounds rich and harmonious and placed realistically. 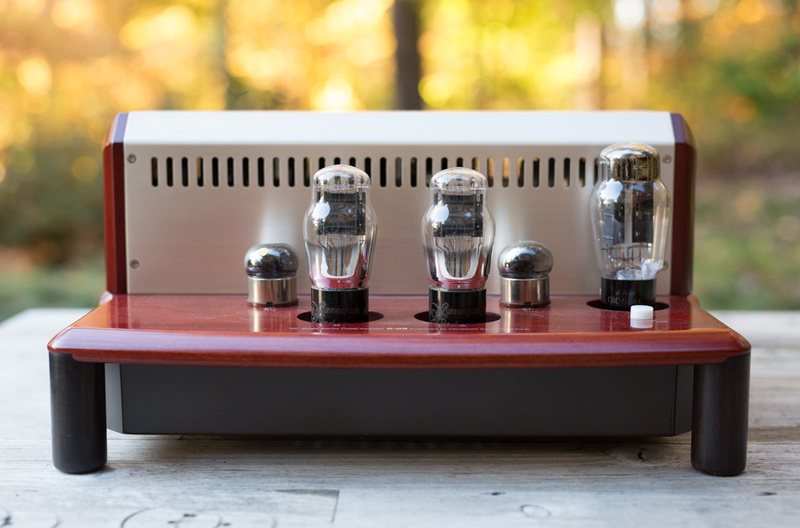 There is something about the way this amplifier presents the music that sounds so pleasant; its not quite tone, but more space and echo…its remarkable. Is the amp adding this or extracting it from the recording? Its hard to say but I’m hooked. Of all the amplifiers I've owned to this point, Sean Caper's AD1 amplifier came closest to this space/placement/reality trick, although now the Yamamoto wins that fight. The Yamamoto and the AD1 are more similar than not, I think. 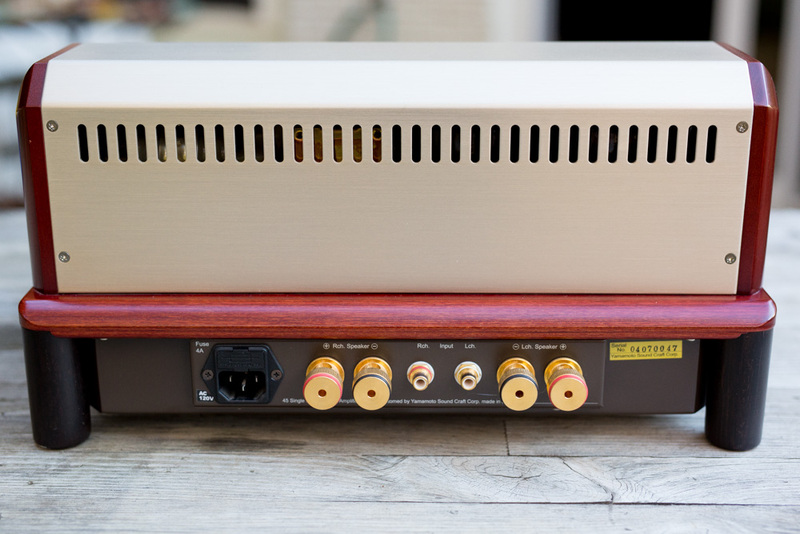 From a build perspective, nothing really compares to the understated elegance and just superb karma that this amplifier has. Everything is just so well executed here its incredible. 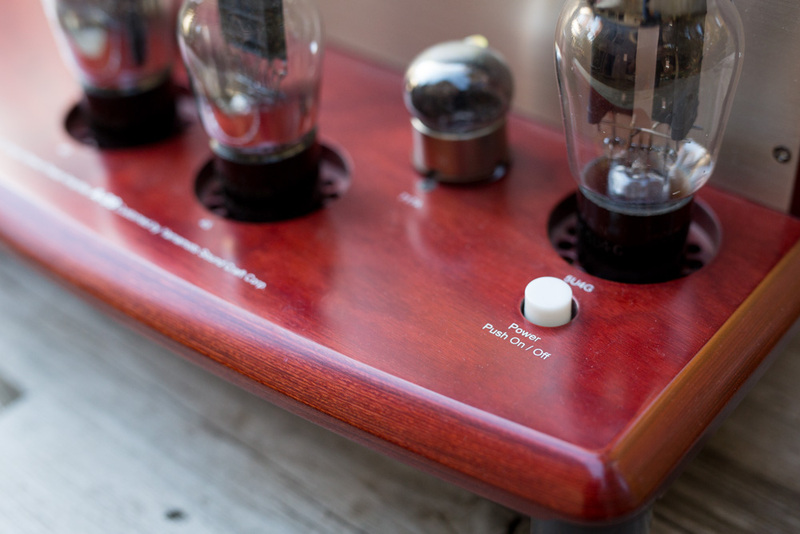 One online reviewer said something about it having a soul and I would agree; if an amplifier could have a soul this one has it. As of Fall 2017, this is my highest recommendation so far. In fact, I’m recommending it to myself for the long run. I think any music lover will be pleased beyond expectation with this music maker. Bravo Yamamoto. Update Fall 2018: While the Yamamoto A08 is still my favorite amplifier so far and the one I envision keeping for the long haul, the Art Audio PX25 probably does eclipse its audio performance in just about every way, if only slightly. But the Yamamoto has something more that seems to transcend being the "best", although it is hard to articulate. 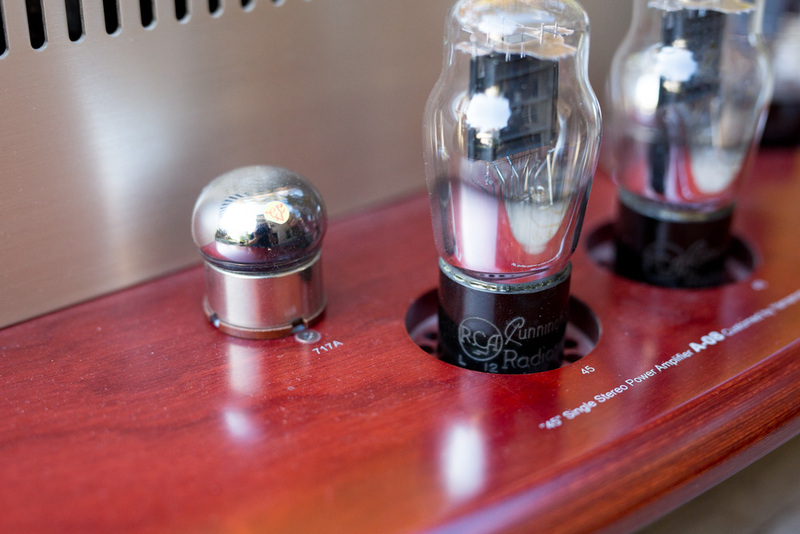 Its just such a wonderfully artful amplifier with great aesthetic beauty to both its construction and performance, and for me, it continues to be the high water mark. 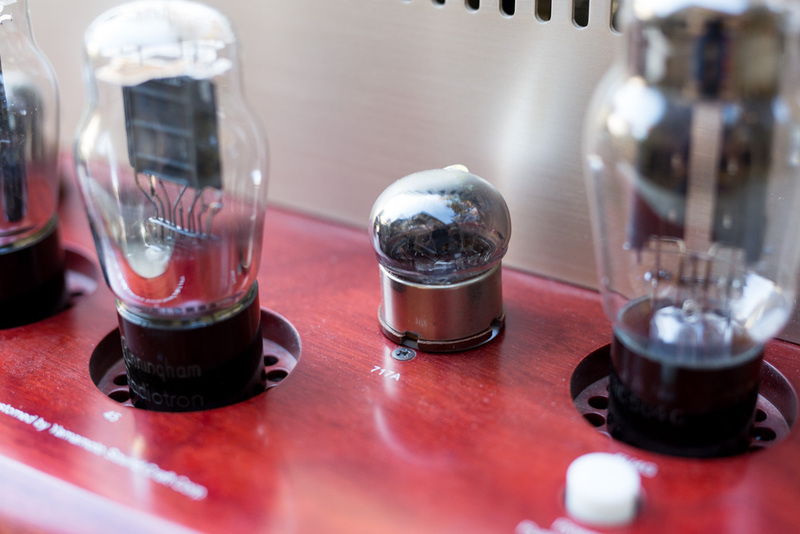 The Yamamoto A-08 with wonderful blue glass Arcturus No.145 tubes from 1931. It doesn't get better than this! Here it is with Ken-Rad UX245 globes, also from the early 1930s. 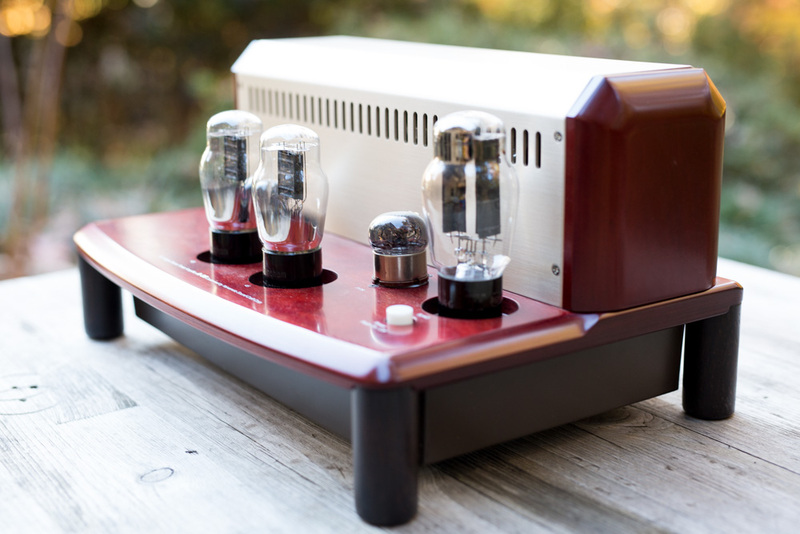 The rectifier is a new Sophia Aqua 274B, a great sounding tube that can be used anywhere a 5U4 is called for. It matches very well with the Yamamoto. The 717A is such a strange looking tube. 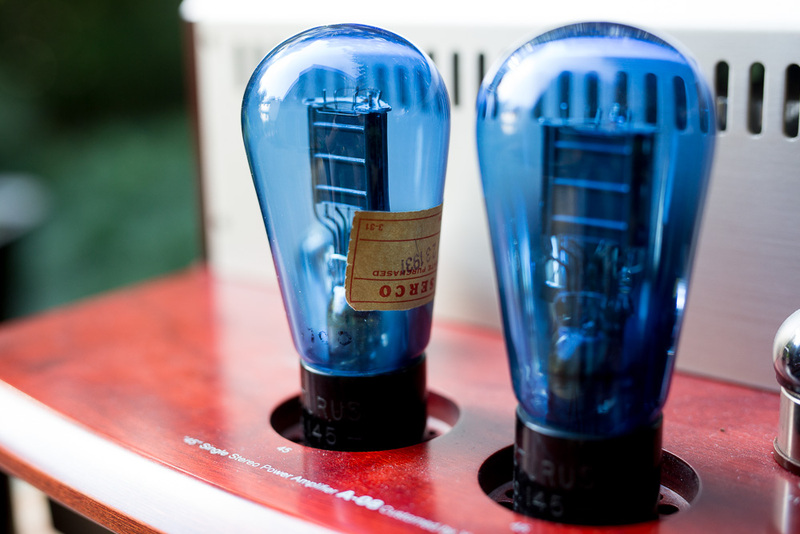 Western Electric, but made by Tung-Sol and Raytheon for the most part back in the 1940's. Prices are very modest for unopened WW2 stock of any kind with a Western Electric label on it, and these are built very well. What a wonderful choice from Yamamoto. Gorgeous! The push button on/off switch actually works really well here and is illuminated when running. In sharp contrast to the hard blue light on seemingly every piece of new Chinese gear; this is wholly Japanese, like a small paper lantern calmly glowing. Heavy duty everywhere, and everything here is custom!